This Success Kit has been designed for the aspirants preparing for the written recruitment examination for the posts of Customer Relation Assistant in the Delhi Metro Rail Corporation. DMRC is conducting recruitment examination for recruiting young, dynamic and motivated Indian nationals to non-executive posts. The present pattern for DMRC Customer Relation Assistant Recruitment Examination has been divided into two parts Paper I and Paper II, sub-divided into five parts namely Computer Knowledge, General Awareness, Logical Ability, Quantitative Aptitude and English Language. The logical ability section covers both Verbal and Non-Verbal Reasoning, whereas the Computer Knowledge section covers the basic knowledge of computers. Each books in the Success Kit contains ample number of solved problems which have been designed on the lines of questions asked in previous years’ DMRC Customer Relation Assistant Recruitment Examination. Also practice exercises have been covered at the end of the chapters to ensure revision of the concepts covered in each chapter. All the questions covered in the books have been designed according to the latest test pattern and the syllabi of the recruitment examination. 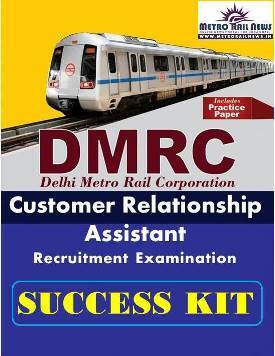 This Success Kit also contains model test papers for DMRC Customer Relation Assistant Recruitment Examination along with its solutions. Previous year solved paper has also been provided to help aspirants get an insight into the recent examination pattern and the types of questions asked therein. As the book contains ample study as well as practice material, it for sure will help aspirants score high in the upcoming DMRC Customer Relation Assistant Recruitment Examination. The Success Kit is available in both language Hindi & English. i have done bsc(hons.) computer science from delhi university.can i apply for the post of station controller?